4450 ft of elevation gain! January 30, 2019 - Somehow I missed the fine print on the approximately 4450 ft of elevation gain, but this truly was a beautiful and hard race. 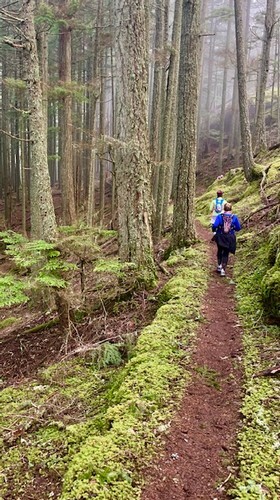 Running through the old growth forest that was both lush and green, really made this a race to remember. The temperature was in the lower 40's at race start with partly sunny skies, but it was 5-10 degrees cooler at the top of this race, which is about at mile 10. Then it's a 5 mile drag race down the steep slopes on the way back to the finish line. I will certainly do another Rainshadow Running event in the future.